Picture the scene: you're at High School and you want to form a band. Easy enough, just find some mates to play along. You want to form a band that seriously rocks, right? Again, crank up the amps and away you go. You want to form a band that decapitates celebrities on stage and wears make-up and Styrofoam costume, caked in blood (or more manly substances) and raging like manical beats? 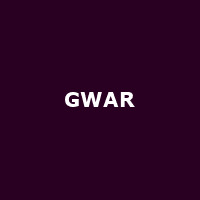 No worries - you call yourselves GWAR, don't you? A quick shopping trip to your local B&Q should sort out what you need (MDF, foam, red paint, white paint) for a full-on theatrical stage-show, that's if you can be bothered to wait 9 hours to get served on a Saturday. Plus, the car-park doesn't have chariot spaces anymore and a credit card with the name, Oderus Urungus, probably won't get past the eyes of the average cash-point assistant, especially with twenty buzz-saw blades and a bench-vice in the basket. But back in the mid-'80s, GWAR formed out of two theatrical and musical outfits in Virginia state, a punk band called Death Piggy and a movie-production project called The Slave Pit. With names like that, you kinda know where this is going already. Their first recordings included a demo entitled, "Let there be GWAR", and so there was. Throughout their careers, band members christened themselves with ridiculous names such as Balsac and the Jaws of Death, Slymenstra Hymen, Nippleus Erectus, Jizmak da Gusha and lead-growler Oderus Urungus and make Kiss look like The Saturdays. Musically, they cut a trench through thrash, trad and power metal and have issued charmingly-titled albums such as "Scumdogs of the Universe", "Bloody Pit of Horror" and "We Kill Everything". Which leads me back to the mention of decapitation earlier in the piece - they've cast a sword to the necks of George W.Bush, Michael Jackson, Sarah Palin, Hitler, Obama, Bin Laden and Arnold Schwarzenegger, plus just about every US president. Of course, by now you should have realized that this is all pure simulated theatre, admittedly rather more edgy than Strictly Come Dancing. 2012 will see the legendary horror-rockers hitting (literally) these shores in a cavalcade of spurting body-parts, obscene lyrical taboos and graphic stage reenactments of, erm, a mucky nature, starting with Brixton's recently-opened Electric venue on 13th Jan, followed by Manchester (on sale tomorrow at 9am), Belfast, Wrexham, Nottingham and Portsmouth. Tickets are priced at £13 - £15. Viking Skull offer support on some dates. Just last month, GWAR guitarist Cory Smoot, who played the part of "Flattus Maximus", died from a pre-existing coronary condition whilst on the band's tour bus. Cory was just 34 years old. The band have retired the character of Flattus Maximus out of respect for Cory's family, but were determined that the show must go on, but slow ticket sales have meant that promoters have pulled the plug. Several of the promoters were alarmed by the low ticket sales, and they decided to start pulling the plug on shows. It got to the point where we had lost so many shows that we simply could not afford to do the tour. We are super disappointed that this happened, and we apologize to all of our European fans for cancelling the tour. We did everything we could possibly do to save it, but it just didn't work out. The tickets are fully refundable so make sure you get your money back!